In an effort to gain a better understanding of a part of what drives certain unwanted behaviors in myself, I have turned back to a book that has helped me learn a lot. 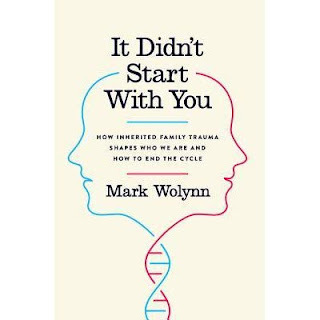 The topic is about epigenetics, or how trauma in our family can be passed down in our DNA. I actually got this book a few years ago and never finished it, but remembered that I had some Aha! moments while reading it. I started back at the begining over the weekend and boy did I have a lot of personal discoveries! This time I intend on writing them down, or perhaps blogging about my discoveries. 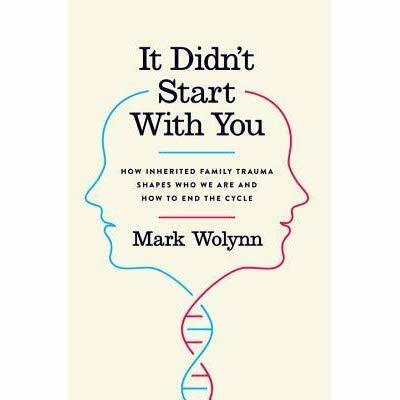 Maybe no one wants to hear about my personal discoveries, I can't speak for anyone else, but I do know that reading the case studies in this book did help me make some discoveries in my own life, so I will share here. I was reminded that when a child is in the womb, hormones secreted by the mother can cross the placenta so the growing baby is also exposed to those hormones. This is not new, we have been hearing about how mother's stress can be detrimental to a fetus. What did ring a bell with me is the mention of how an unwanted pregnancy would raise all kinds of stress hormones in the mother. I also considered how a pregnant mother might have additional stress in trying to control behaviors in the way of drug, alcohol and eating habits via restriction. I know for myself, when I was pregnant I tried to eat healthier and stopped drinking coffee and alcohol of course, the eating part was the most stressful piece of that for me. Luckily I was in a happy marriage and the concept of having a baby, while unplanned, was actually happy for me. My mom was only 18 when she became pregnant with me, and I am a second child! She had a very hard pregnancy with my older sister and she got very ill at the end of her pregnancy with me, to the point where doctors told her if she had another child it would probably kill her. I don't know if my parents were in love or even wanted children, they fought a lot when I was young so I can at very least imagine that having children was a stressful thought. My sister and I were born less than 2 years apart, they were young and poor. The really interesting part about all of that is, my own mother inherited her mother's stress genes which also played a part when I was in the womb. My grandmother had a very difficult and unsatisfactory life. She revealed late in life that she had always thought she could have done much better for herself. My grandfather was cold and abrasive and the two of them abused their children in all manners. It becomes a tunnel, the generations of people struggling, some of them due to the fact that they were immigrants with so little left when they got to the U.S., I started to see the bricks piling up that created the wall of "stuff" everyone in my family seems to have built up. I inherited that, not just from my parents, but from the generations; it trickled down to me and I didn't know what to do with it so I tried to comfort myself with food. There are many other ways this manifests, but from the first few chapters of re-reading, the mother's stress while pregnant caught my attention. Many times as a child I felt unwanted, and now that I turn my attention to it, I imagine my own mother felt the same way in her family, and perhaps my grandmother felt the same. Having children used to be more of a practical thing than an endearing, emotional thing, and I think the parent-child bond was probably different. My mother's family had a very cold feel to it, very much "tough love", it's hard to get a warm fuzzy feeling from that. My father's line has some hidden secrets ( I am learning a few now that I am doing family research); they were a little happier lot but there was a lot of alcoholism in that family too, which leads me to believe that those secrets were not easily overcome. My father lost his mother to cancer when he was 14. All of these events of my parents' lives eventually affect me because it shaped who they are and how they parented. This information, so far, helped me examine the times I felt rejected and how that had such a huge impact on my self esteem and I still react (or sometimes overreact) to that. I feel unwanted. Perhaps I am reacting to that because my mother felt that way about me while she was pregnant with me. Who can blame an 18-year old mother for not wanting another baby to care for with so little money to do it with. The other trigger that arises in me, which I believe to be correlated, is that of being a burden. My mother's parenting skills were lacking at best, at times she was down right degrating and horrible to my sister and I and she never missed the opportunity to let us know when we were being a burden. Even today, she has huge issues with the idea of being a burden to anyone. She went so far as to tell my sister that she would rather go drive somewhere and lay down in a field to die than to have someone having to care for her if she becomes unable. When her own mother was elderly and feeble, my mother took on much of her personal care and ended up so bitter and resentful for having her mother be such a burden on her. So the idea of being a burden is something that has haunted me. And being an unwanted burden has a tendency to make someone withdrawl a little. It is also one of the driving reasons I want to fix my health so that I can stay mobile as I age. As a child, I ended up being painfully shy but equally rebellious. My parents didn't hand down many coping skills, I am having to teach myself a lot as an adult. So that's where I am now, trying to figure out not just my triggers, but where they come from. Is it my own trigger or my mom's? Is it my granmother's trigger or maybe someone else's who I adopted as my own? Knowing will help me be able to realize when certain triggers are being activated, and being aware of that will help me break the conditioning of looking for the immediate place to hide within food or numbing myself in other ways. The big big deal at the end of it is that I get to decide how I feel about these things aside from anyone else's influence on me, but first I have to uncover these triggers. I really think that people who are really truly happy/joyful/content in their life are not compulsive eaters and once we can fix the thinking we fix the eating. If that's not the case, at very least I will have gained a better understanding of myself and my family. I hope you all stay warm and safe! Happy Wednesday!